“Get out of my house,” is what I’m thinking as I stare at these ultra-tempting, mildly sweet, nut buttery oat squares right now. I just can’t stop nibbling. Besides their deliciousness, they are extremely easy to make. You don’t need to dirty your food processor to make these raw bars. A bowl, a spatula and an 8 x 8″ baking pan are your tools. 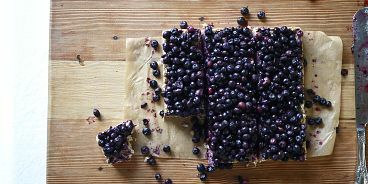 This recipe is adapted from This Rawsome Vegan Life’s “Creamy Peanut & Oat Squares with Raw Chocolate and Blueberry Topping” (found in her cookbook). 1. Mix all your ingredients (except the blueberries) together in a large bowl, then transfer to a parchment lined baking tin, and press into the bottom of the pan (so you can later cut into firm squares). 2. Pour your blueberries on top of the gooey mixture so they stick. Transfer to the fridge for a couple hours so it sets. 3. Serve chilled. When you cut, the blueberries can get a bit messy. It’s a beautiful mess.